grilled alpaca 0 cholestrol, originally uploaded by shashiBellamkonda. We ate this very nice restaurant called Pachapapas(http://www.cuscorestaurants.com/pachapapa_eng.htm) , located at the San Blas Square in Cusco, Peru. Its a sister restaurant of Inka Grill or MAP in Cusco Peru. Mery Calderon Owner of Kuoda Tours (http://www.kuodatours.com/) who managed our entire itinerary joined us for dinner. She is a fountain of knowledge, having worked in the luxury travel business for over 15 years. As i wanted to try alpaca meat (First time in my life) and Mery suggested this dish - Marinated Alpaca Brochette , corn tamales, stuffed roasted hot rocot and assorted potatoes. This dish was fantastic . 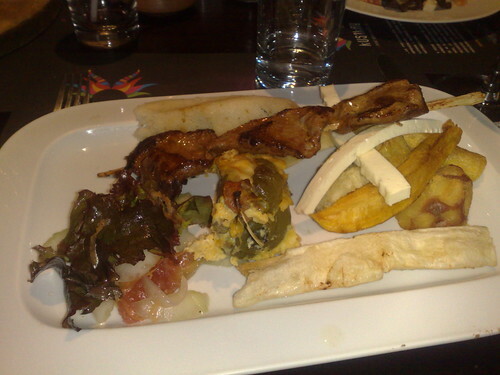 I ate it accompanied by Cusquena beer and we had a fantastic meal.